State Representative Brian Stewart announced today that Governor Bruce Rauner has signed a bill Rep. Stewart sponsored, House Bill 4476, which will remove the requirement that a person cited under the Illinois Vehicle Code must sign a ticket for a petty offense. The bill further provides that when an out-of-state resident fails to appear for a court date, the procedure is the same as for an Illinois resident. 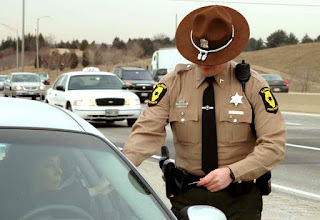 The Illinois State Police spends thousands of dollars annually for the paper that is required for an alleged violators signature. In 2016, the Illinois State Police issued 151,379 paper citations, Rep. Stewart explained. Not only will this produce a cost-savings for the State and Local governments but will increase officer safety by not requiring they get a signature for petty offenses. Currently the Illinois Vehicle Code requires a person to sign a traffic citation when required by Supreme Court Rule. House Bill 4476 amends this requirement out of the Vehicle Code. The Illinois State Police and the State Police Command Officers Association were proponents of the legislation, which passed the House 109-2. Governor Rauner signed the legislation into law on August 3, 2018.